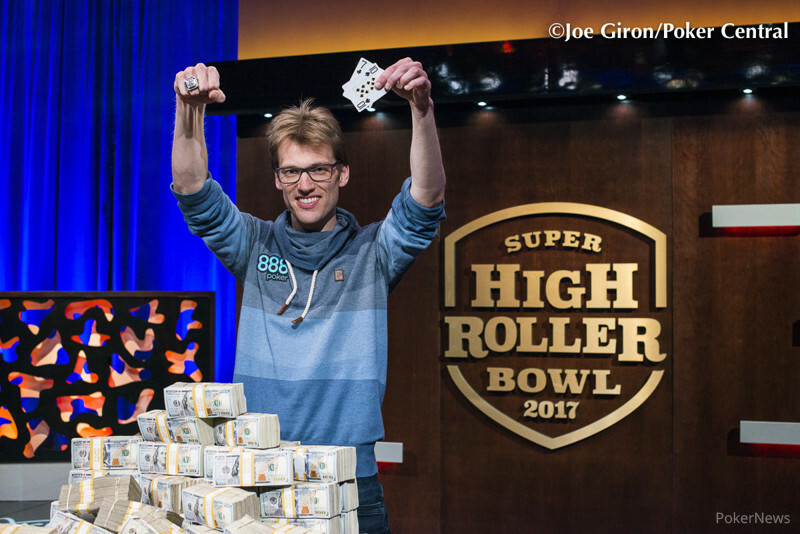 After nearly five hours of heads-up play that saw the chip lead swing a couple of times, German pro Christoph Vogelsang emerged victorious over American pro Jake Schindler to win the $300,000 Super High Roller Bowl at ARIA. Vogelsang nearly doubled his career live cashes to almost $14 million with, shockingly, his first live win. The high roller mainstay had previously done no better than third, with his finish there at the 2014 $1,000,000 High Roller for One Drop for $4.4 million the previous highlight of his tournament career. Vogelsang also moved up to second on the all-time money list in Germany behind only the incomparable Fedor Holz. And it wasn't just prize money Vogelsang apparently won. He and his fellow Germans had an eight-way last longer for $2,000 apiece, so Vogelsang won that cash and bragging rights, plus a $13,500 World Series of Poker Main Event package provided by 888poker. The day started out with three runners, but one lagged far behind the other two. Stefan Schillhabel had less than 15 big blinds to start the day. He experienced some early success running his 885,000 up to 1.6 million, but the fast start ended there at the hands of his fellow German. Schillhabel had about 25 big blinds when he opened with ace-jack on the button and got three-bet big by Vogelsang after Schindler called in the small blind. Schillhabel shoved all in only to see his countryman turn over pocket queens and hold up despite a jack-high flop. That set up the heads-up match viewers were expecting, and it proved to be a battle. Schindler had about a 2-1 lead early, and the early feeling-out period seemed to go mostly his way, as he picked off a big bluff to move to a 3-1 edge. Schindler seemed to be on the brink of victory when he got Vogelsang to put in most of his stack before the river on a check-call line with a king-high flush draw in a three-bet pot against Schindler's turned top pair with ace-king. Vogelsang hit the flush on the river and checked, quickly calling all in when Schindler shoved. The German moved into the chip lead himself and eventually had his own 2-1 edge. However, Schindler battled right back, and he eventually took a huge lead, chipping Vogelsang down to 2.7 million at 50,000/100,000/100,000 — the big blind paid the entire ante under this structure. Then, Vogelsang hit another sick river. This time, he called down ace-five after limping the button when Schindler raised big blind and flopped a set of eights. Vogelsang flopped a gutter and got there on the river, shoving all in when Schindler checked and getting paid off. Schindler could only muck in frustration. Shortly after that, Schindler attempted to pull off a river bluff-shove when he missed a combo draw that he picked up on the turn. The board had paired deuces on the river, weakening Vogelsang's two pair a bit, and he had only 30 seconds to make his move as he had used all of his allotted time extensions. The pressure was on, but Vogelsang found the call button. He got out of his chair and pumped both fists, having won the biggest tournament of his career and joined Brian Rast and fellow German Rainer Kempe as Super High Roller Bowl champs. Jake Schindler limped in with , and Christoph Vogelsang checked . The flop came , and Vogelsang checked. Schindler bet 100,000 and Vogelsang called. On the turn, Vogelsang checked again. This time, Schindler bet big with 400,000 into a pot of 500,000. Vogelsang came out raising with 1.5 million. Schindler called, seeing a fall. Vogelsang bet 2.3 million and dropped his head to better prevent Schindler from getting a read. Schindler thought briefly and then announced he was all in for 6.2 million. Without any time extensions left, Vogelsang had to think fast, and the decision he came to was a call. Schindler's bluff had been caught, and Vogelsang stood up, slapped his cards down and pumped both fists in celebration with a wide grin on his face. Christoph Vogelsang limped the button and Jake Schindler raised to 500,000 from the big blind holding . Vogelsang called as the flop landed and Schindler bet out 275,000. Vogelsang called and the turn landed the . Schindler cut out a bet of 900,000 and Vogelsang called as the completed the board on the river. Schindler now tapped the table, and with the action on Vogelsang he moved all in for 3.2 million and Schindler snap-called. Vogelsang tabled his for a wheel and Schindler shrugged his shoulders and tossed his set of eights to the muck. Christoph Vogelsang raised to 500,000 with when Jake Schindler limped . Schindler called and flopped. Vogelsang bet 400,000 and Schindler called. On the turn, Vogelsang check-called 450,000. On the river, the German moved all in for 2 million, a little under the size of the pot. Schindler folded. Jake Schindler opened to 275,000 on the button with and Christoph Vogelsang three-bet to 925,000 holding . Schindler shoved for 12 million and Vogelsang quickly folded. 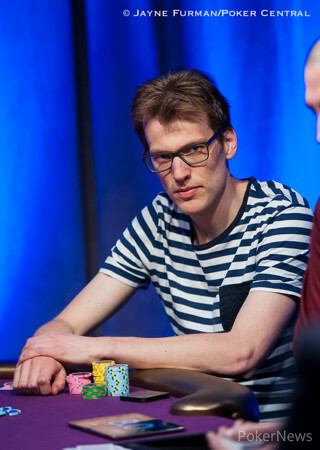 The next hand, Vogelsang opened and Schindler three-bet with , forcing a fold. Jake Schindler opened the button to 300,000 holding and Christoph Vogelsang called in the big blind holding . The flop fell and Schindler continued for 175,000 as Vogelsang check-called. The turn landed the and Vogelsang checked to Schindler who bet 600,000. Vogelsang called and the river of the completed the board. Vogelsang moved all in for 1.7 million and Schindler folded. 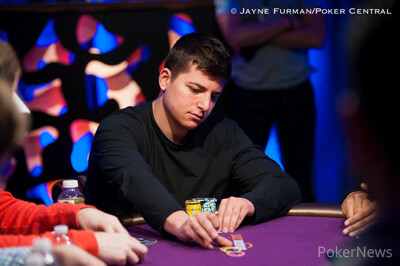 Jake Schindler raised to 275,000 with , and Christoph Vogelsang called with . On the flop, Vogelsang checked. Schindler bet 300,000 and Vogelsang made it 800,000. Schindler called and no more action followed the or . The nines stayed best.